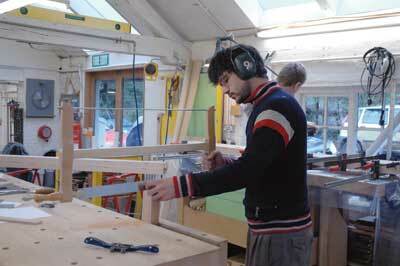 The new year at Froxfield brings with it a slight change in the apprentices' workshop. A short-term student is arriving. The workshop takes occasional paying students; they provide extra income and spread the Barnsley method around the world. The student hadn't arrived when I visited but the benches had all been moved around to make extra space and Nat was making a new bench. At this stage it is just planed-up timbers but next month I will be giving details of the construction and the tune-up that he will be giving to the metal tail vice assembly that they use. 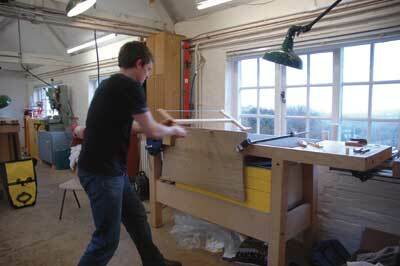 Meanwhile Josh and Rob are finishing their oak curved low tables, see F&C149. I noticed that Josh was using a frame saw. This is the ideal hand tool for cutting long sweeping curves. 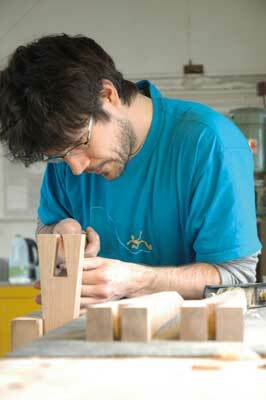 I have also seen it used by Continentally trained cabinet makers for cutting shoulders on dovetails. Certainly I think it is an underused tool in the UK. Some might argue that we have adequate bandsaws and dovetail saws, but the problem with any new tool or technology is that there is a 'breaking-in time'. Almost inevitably a new tool will be slower that your original tool until you have become used to it. As time is of the essence for most of us, there is a resistance to spending time learning how to use new tools. However, having worked with a German cabinet maker/restorer I can confirm that the frame saw is worth mastering. "As our apprentices are still in the handwork phase of their training they unfortunately cannot use the bandsaw as much as they might like to. We have to be uncompromising about this facet of the training as relaxing rules can become a slippery slope. 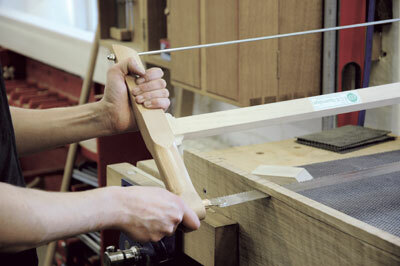 A coping saw could cut these curves but it would not be very accurate and would be hard work. 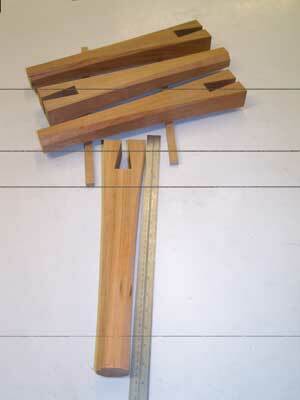 The correct tool for the job is a frame saw which is how it would have been done back in the past. 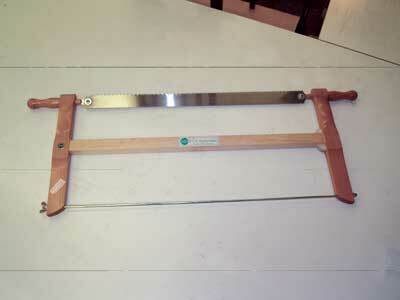 The saw cuts quite aggressively and makes short work of the cuts required. However, it does take some getting used to."